What do you now know about the card that is different than when you began? Then sketch the setting and the person having the experience. Let me know how this works for you. Cheers! After the Tarot and Psychology day in New York City, even more people arrived and we took part in the three-day Readers Studio, a tarot conference that began in 2003 and has been going strong ever since. Again, our wonderful hosts were Wald and Ruth Ann Amberstone, founders of the Tarot School. The premise of the Readers Studio is to exchange readings with one person on the first day, then revisit these foundation readings on the final day after experiencing three principle workshops over the course of the gathering. This way, attendees can try new ideas and skills they learned and notice how they enhance their ability to use the tarot. This year’s key presenters were Mary Greer, Caitlín Matthews, and Sheilaa Hite. On Friday afternoon, Mary Greer offered a presentation called Things that Make Your a Better Tarot Reader AND Thinker. It consisted of information about neuroscience, the mind, emotions, and intuition, partially derived from Jonah Lehrer’s work on decision making and problem analysis. Before the break, Mary provided the research, controversial to some people who consider themselves “intuitive readers” because much (but not all) of what we call intuition may actually be projection, a desire to be liked, and other unconscious mental processes. After the break, we assembled in groups of five for an experiential exercise in which one member of the group played the role of a querent who is poor, has several children, is pregnant, single, and considering an abortion. 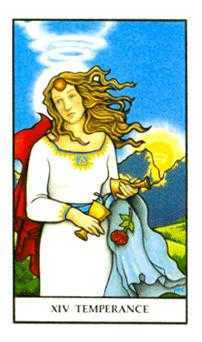 The task of the other group members was to give a tarot reading that could advise the querent of the best thing to do. It was interesting to observe ourselves juggle our “objective” tarot knowledge with the desire to be helpful to someone in a deep predicament without wanting to be wrong or misleading. The principle thing I took from Mary’s session was an admonition to self-monitor during tarot consultations so that, as much as possible, I can discern the difference between my personal “stuff” and material that is meaningful and useful to my clients. Caitlín Matthews‘ Saturday morning workshop — Which Way are Your Cards Facing? — was an experience of using the tarot in an older cartomantic manner. The basis was to simply notice the direction in which the characters and gestures on the cards are looking or pointing and to follow that line of sight to weave a coherent narrative. Employing spreads of anywhere from two to 15 cards, we practised making our readings even more forensic, “rectifying” reversed cards by adding new cards above or below them until we received upright cards in which the action seemed to stand still. These added cards provided more backstory in the case of the past and more gateways to possibility and specificity in terms of the present and potential futures. It was particularly fun to do a reading for a fictional character using this technique along with an 18th century layout that reveals what is in the subject’s thoughts, in their heart, what’s disagreeable to them, and what they do not want to confront. The character I chose, from the T.V. series Little Britain had his “don’t want to confront” issue depicted quite literally by the Bounty/Empress card from the Medicine Woman Tarot which led to much hilarity with my reading partner. From Caitlín’s session I received the gift of trusting the tarot images, their relationship with one another, and the story that emerges from these relationships as relevant and specific to the querent and hir enquiry. The Saturday afternoon presentation was Relationships and the Tarot — Reading Expansively and More in Depth by Sheilaa Hite. We were encouraged to have a wide body of knowledge about colour, natural elements, astrological symbolism, etc. in order to connect the dots so that as readers we’ll be less likely to “wing it”. Sheilaa provided us with two relationship-themed spreads — the Diamond Spread and the Two of Cups Spread — from her new book that can be used to explore any form of relationship — romantic, professional, familial, and so forth — as well as several pages of guidelines and card meanings that she finds useful. She also demonstrated her layers of knowledge by applying sample tarot cards to specific positive and negative questions. My takeaway from Sheilaa’s workshop was a reminder to get to the question behind the initial question (the real issue), select or create a spread specific to the real issue, and know our cards thoroughly enough to interpret them in light of the spread positions in order to be on target and effective. 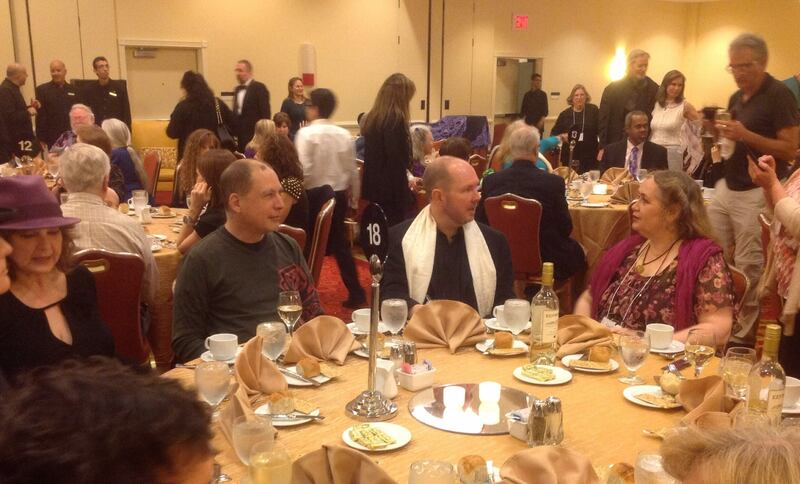 Ellen Lorenzi-Prince, Yoav Ben-Dov, James Wells, and Caitlín Matthews at the Saturday banquet. In addition to these very good main stage offerings, people could partake of Friday evening study groups presented by Rachel Pollack, Theresa Reed, Brigit Esselmont, Dina Berrin, Nancy Antenucci, and Katrina Wynne. On Sunday, I led the Tarot Incubators Process in which a variety of topics were hosted at different tables so participants could hatch a new tarot-related project or idea and brainstorm with one another about the project’s possibilities. Vendors offered a multitude of delights: tarot decks, books, bags, jewellery, mini shrines, and so much more. The Saturday night banquet was an opportunity to mingle, laugh, eat good food, sip wine, and enjoy one another’s company and knowledge in a less official way. The after-dinner entertainment was a delight. I also had the opportunity to offer private tarot counselling sessions to several people — profoundly moving to witness and journey with people’s experiences over the cards. 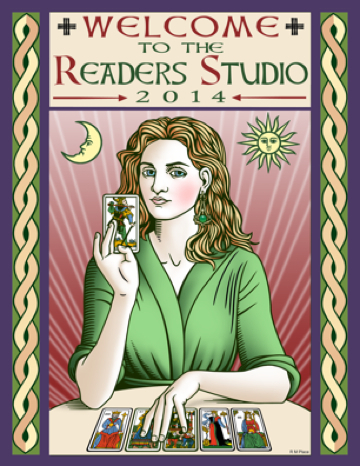 The 2014 Readers Studio was a warm and enriching experience. It was educational as well as a chance to reconnect with old friends and finally meet correspondents in person. I encourage people to attend the 2015 gathering whose three key presenters will be Carrie Paris, Ellen Lorenzi-Prince, and Theresa Reed. See you there! Banquet photograph by Donnaleigh de LaRose. Last week, I spent several days in New York City taking part in tarot-related events. The first of these was the one-day Tarot and Psychology conference hosted by the Tarot School on Thursday, April 24. This was the second time that the Tarot and Psychology day was offered. I appreciate that there is time dedicated to the meeting of these two arts through three presentations. Our first presenter was Dr. Joseph Schippa, a licensed clinical psychologist. Joe occasionally employs tarot in his work, as needed, in addition to Emotional Freedom Techniques (EFT) also known as “tapping”. EFT involves tapping on certain accupressure points while repeating agreed-upon phrases in order to send a calming signal to the amygdala (the part of the brain that encodes emotions and long-term memories) and reset the hippocampus (the part of the brain which compares past threats with present signals). The presentation also covered employing the tarot as a projective psychological tool much as one might use a Rorschach inkblot or Thematic Apperception Test. The blend of the tactile, visual, and verbal when one employs the tarot, projective techniques, and EFT carries great potential for rich insight and real inner change, allowing the reader to deepen her/his practice and clients to integrate the tarot encounter in their lives. I can see myself employing this blend of techniques with myself and with certain people who consult me because I truly want to use the tarot in a helpful change-making manner. Kooch Daniels and Dr. Victor Daniels provided the second presentation, Gestalt Therapy and the Tarot. Victor and Kooch emphasised the representational use of tarot cards. In this way of working with the tarot, the client selects cards from a face up pack to represent specific elements in his/her life rather than choosing them at random from a face down deck. The consciously selected cards are then employed in projective dialogues in which one card representing oneself engages in a conversation with one or more cards that represent another person, other people, layers of emotion, or another aspect(s) of oneself. The presenters invited an audience member onstage to take part in a dialogue with someone in her life with whom she had had a conflict, speaking alternately as one card then the other. We were given time to do this process in partners at our tables. I chose to encourage a dialogue between two parts of myself: Comfort Creature (represented by the King of Cups from the Connolly Tarot) and Earth Healer (depicted by Temperance from the Connolly Tarot). After a heated argument, these two subpersonalities agreed to explore the meaning of the term “quality” as a team. This powerful process is very useful, allowing clients to interact with the information and expertise that is already in them. I already employ some of these ideas in my tarot work and it was helpful to expand on them in order to add to the repertoire. Jeannette Roth, co-proprietor of the Tarot Garden, gave us the gift of the Rosetta Stone Method, a tarot-based approach to improved relationship communication, applicable to all forms of relatedness — romantic, professional, community, friendship, therapeutic, etc. The practitioner and client choose a spread that addresses the client’s issue or question. The client chooses two different tarot decks, one that s/he feels is like her/him-self and another that s/he feels most feels like the other person in her/his life connected with the topic under discussion. A reading is performed using the first deck, then the corresponding cards from the second deck are laid out. Both reader and querent compare the cards, looking for similarities and differences between the two sets of tarot pictures. Similarities show metaphors that both parties already understand in each other while differences demonstrate metaphors about which each party might not yet be aware or are ignoring. The point is to bridge differing metaphors so that the two parties can communicate more clearly with one another, lessen misunderstandings, and stand a better chance of having their needs heard and met. Jeannette’s method is elegant and immediately applicable. Just like the Rosetta Stone, it cracks codes of communication between ourselves and those who matter in our lives. When I used the process, I realised that what I believed I did well when I communicated with a certain person was actually what *they* did well and I needed to integrate more of it into my interactions with them. Pow! The Tarot and Psychology conference was enlivening and catalysed fruitful discussion at the evening cocktail reception and over the next few days at the next event. Gratitude to Ruth Ann and Wald Amberstone for calling and hosting the event and to Joe, Kooch, Victor, and Jeannette for taking us and the cards into fascinating fresh territory. 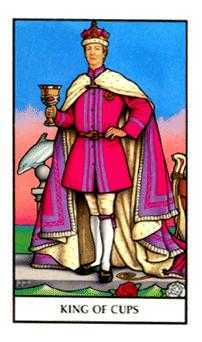 Images: The King of Cups and Temperance from the Connolly Tarot by Eileen Connolly & Peter Paul Connolly.